Don't Mind if I Do: Quinoa? As someone who studied nutrition in college, I love finding new nutrient-packed foods that are both versatile and satisfying. Quinoa is one of those foods. I had heard about it in my classes but didn't know too much about it. And now that it's becoming more popular among health-nuts and the special diet population, it is more readily available everywhere. What is it, you may ask? It's a naturally gluten-free super grain, high in protein, a great source of fiber, calcium, and all sorts of other good stuff. This salad I adapted from my friend's recipe at Coconuts and Cardamom is the perfect way to prepare this simple but amazing grain! Prepare Quinoa as instructed on the packaging. Different varieties have subtle differences. A basic rule is the 1:2 ratio, 1 cup of quinoa to 2 cups of water. I add a dash of garlic salt for added flavor. While the Quinoa is simmering, prepare the other ingredients. Dice the avocados and toss in some lemon juice. Dice the tomatoes and cucumbers. Drain and rinse the beans. De-pod the edamame if needed. 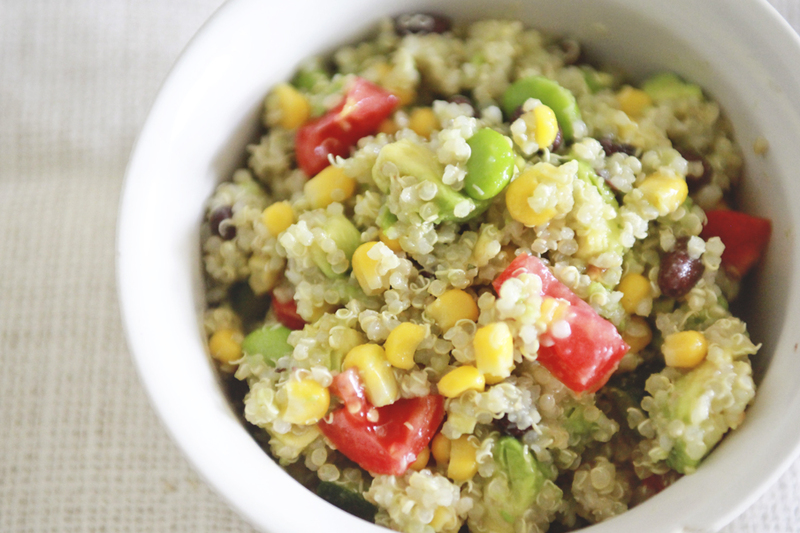 Use frozen corn, because the steaming hot Quinoa will bring it quickly up to room temp and it doesn’t turn mushy. 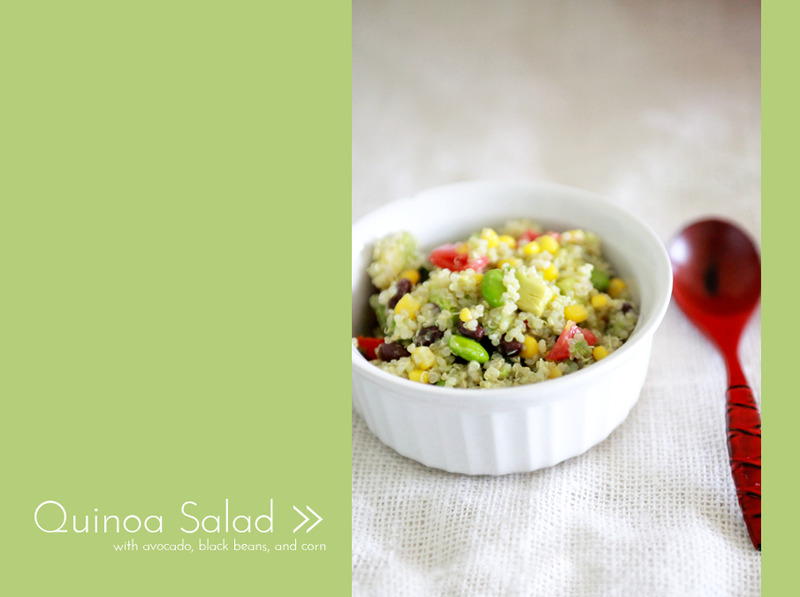 Throw edamame, beans, corn and slivered almonds in a large bowl and empty the pot of Quinoa on top. You'll know when quinoa is ready when it is tender and the germs have spiraled out. Drizzle a couple tablespoons of olive oil. Add salt and pepper to taste. Mix everything together well. Add the avocados last. *From Tawny: If I know this salad will last a few days, I only add one portion of avocado to my serving, and I’ll set aside the rest in a bowl with the lemon juice. This prevents the avocado from leaking into the salad, turning brown, and making the whole salad go bad to prematurely. *I would leave out the tomatoes to, if planning to make it last. **Good both warm the day of and cold from the fridge! I need to get myself some quinoa! Love the recipe, and gorgeous photos! !